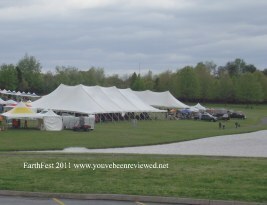 Here are a few photos from EarthFest 2011. My camera batteries were in the death throes so I didn't get to take too many photos. These are shot from the parking lot looking toward the festival. There was parking right in front of the main building as well as further out from the site. Hubby and I had a great time this year as always. It was breezy and a little cool so there was little danger of anyone becoming overheated. There were several vendors and sponsors at EarthFest 2011. We exchanged our plastic grocery sacks for a reusable tote from Mercy Health. Over at the KUB booth we traded two of our old lightbulbs for one of the new energy efficient variety. I wasn't sure how the festival would be without the musicians. It pains me to say this but it worked pretty well. You could easily have a conversation and hear the vendors at the booths. If it was a warm day the music may encourage people to stay longer. One of Hubby's favorite stops (that I wish I had gotten a picture of) was the new Volt car. We were told that combination of gas and electric would yield 93 miles per charge and fill-up. The gas mileage is great in the city but not so hot if you run gas only on the highway. The same Volt expert told us that highway mileage plummets to 35 mpg on gas only. That's about what I get in my PT Cruiser. The Volt looks great but doesn't seem to be a long distance vacation car. For me, being able to make long distance travel in non-negotiable. Seeing it at EarthFest 2011 was pretty cool. So, now that you've waited forever here are the photos that you wanted to see. 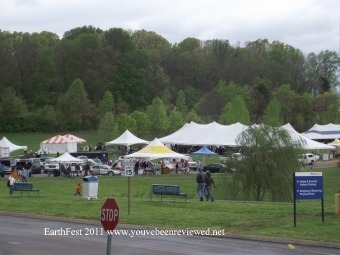 Don't forget to mark your calendars for the next Earth Day celebration. It's at Maryville College. The Blount County Chamber of Commerce has all the details for that event.